the extension ".car" to be detected by the datatype. you might want to use the original instead. and others as ASCII, so you need a descriptor for each type. 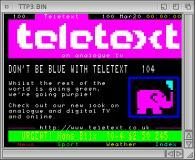 "Teletext" is the binary mode one, "Videotex" is text mode. Most of the icons are by Ken "Ken's Icons" Lester.